This won’t happen overnight but human nature always repeats so expect a huge decline in the Shanghai Stock Exchange within the next several years. Well, take a look at what has happened to the Shanghai markets since my post last October: The chart has dropped in almost an exact shape and slope as did the NASDAQ in 2001 and 2002. 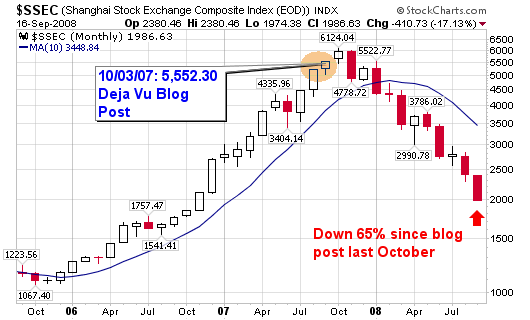 The index is now down more than 65% since my blog post and more than 70% since its peak. “Wall Street never changes, the pockets change, the stocks change, but Wall Street never changes, because human nature never changes” – Jesse Livermore. 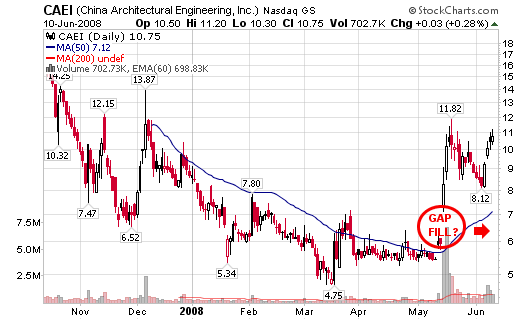 Take a look at the charts from 2007 and compare them to the charts above. Human nature! 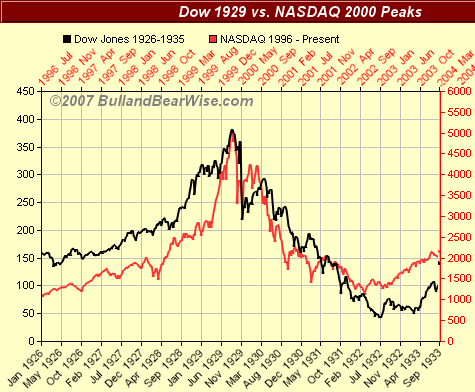 The rise of NASDAQ in the late 1990’s has been compared to the rise of the Dow of the late 1920’s. Chart overlays are amazingly similar. Well, the current two year rise of the Shanghai Stock Exchange Composite Index looks remarkably similar to the rise of the NASDAQ of the late 1990’s and the charts below explain better than I can! 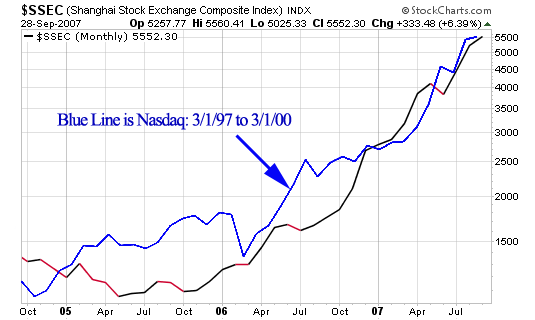 The NASDAQ rose from 1,250 to 5,132 from March 1997 to March 2000: 310% gain! 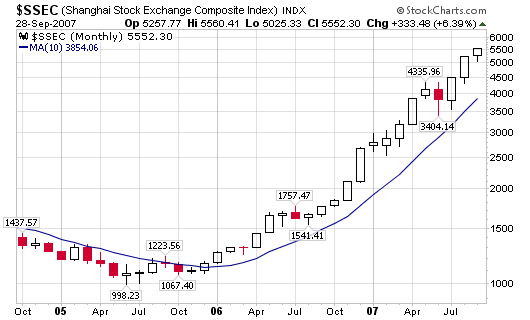 The Shanghai Stock Exchange has moved from 998.23 in June 2005 to 5,552.30 today (10/2/07): 456% gain! 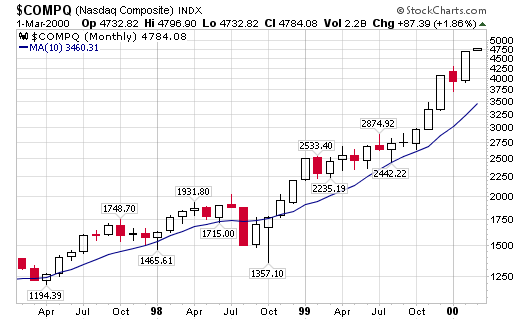 As you can see, the blue line of the late 1990’s NASDAQ has moved meticulously with the Shanghai Index of today. 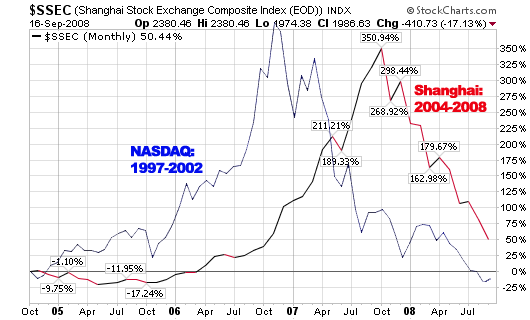 Will the Shanghai Stock Exchange end up with the same result as the NASDAQ of the late 1990’s. 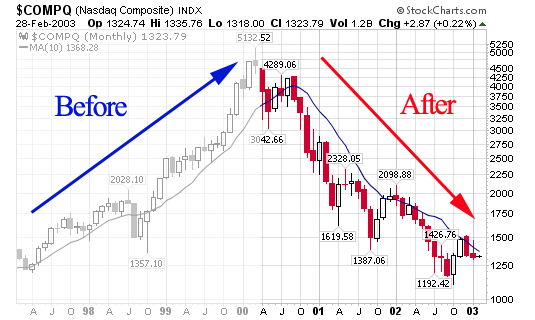 As you can see, the NASDAQ went from 1,250 to 5,132 back down to 1,192 (all within a five year period). Although the company has “China” in its name, 45% of its revenue comes from Australia, Dubai, Qatar, the U.S. and Europe. Business week noted that growth should last well beyond the Olympic games this year because of robust orders in foreign markets. The company’s order backlog is said to be at $100 million or 1/5th of its current market cap, a nice card to have up its sleeve in today’s world market. The gap-up on the chart in May on huge volume concerns me when attempting to establish a solid risk/ reward trade strategy. I would like to see the gap fill prior to entering a position but I do see support along the 50-d m.a. or even $8 per share. I am going to set-up the “ideal trade” using the current moving average so we can cover a potential pull-back to the gap-up area noted on the charts. The stock is starting to pull back to the 50-day moving average which will offer us a solid entry opportunity with an excellent risk-to-reward ratio. If my swing target method can offer any accuracy whatsoever, we could be looking at a 10-to-1 risk-to-reward trade. A buy in the $16 to $17 area could also provide us a 5-to-1 risk-to-reward ratio assuming it can get back to $23 without violating the stop. Not bad if you ask me. 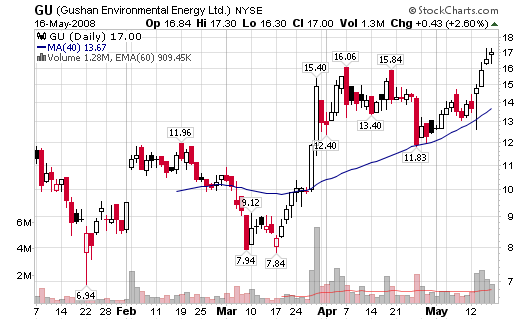 I will be taking on the trade if it drops below $17 and holds support at the 50-d moving average. Maybe it will work, maybe it will flop. As I say every time (like a broken record): take the trade and follow the rules. That’s all we can ask! 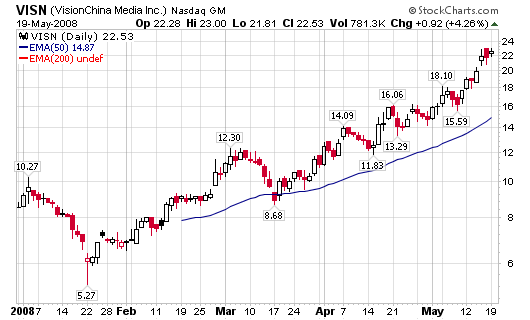 VISN – 22.53, VisionChina Media Inc. has also been tearing up my nightly screens but it slipped past any and all ideal entry points for me as a trend trader. It is now in the hands of the day traders with a year-to-date gain of 146%, a 148% gain over the past three months and a 42% gain over the past month. 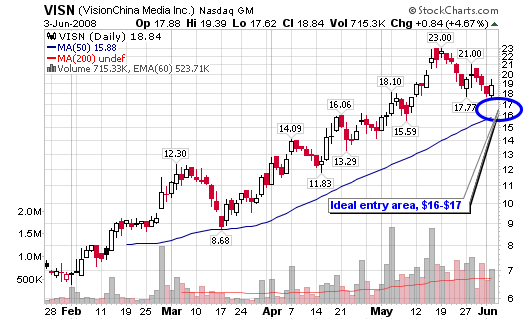 VISN – 18.88, VisionChina Media, Inc.
Target is $30 for a 10-to-1 risk/reward ratio. A move back to $23 with a buy at $16 would be a 5-to-1 risk/reward trade. 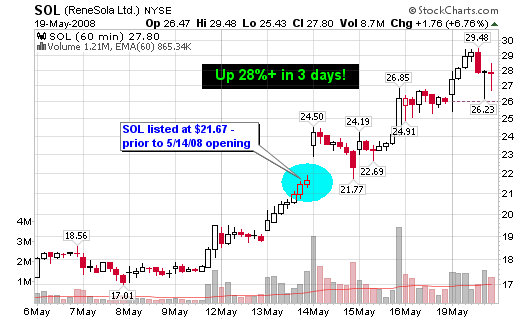 SOL – 27.80, ReneSola Ltd. was up 6.76% Monday on volume 325% larger than the average. 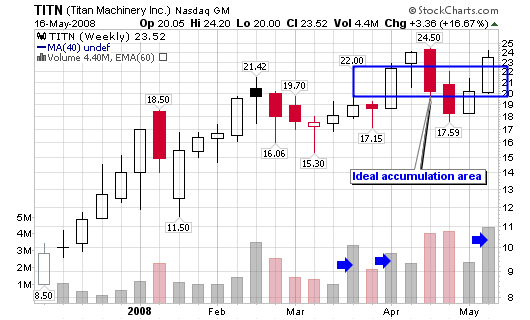 I told you last week that this was one momentum stock you should not ignore. It’s now up almost 30% in three days after my Thursday morning post. It was up 15% last Wednesday, one day prior to me highlighting the stock which is why I will repeat that stocks in motion typically stay in motion (simple physics – right). 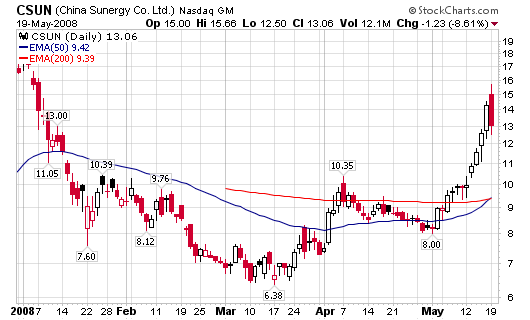 Renesola Ltd (SOL), $21.67, is on fire over the past several weeks since its IPO debut in January. Volume has been exploding as the stock is up almost 200% since it’s low in late March. I have been watching the stock as it has crossed dozens of nightly screens but decided not to post it to the blog until now. If you want momentum, SOL is currently providing it. The stock was up more than 15% today on volume 409% larger than the average. At least 11 accumulations days have occurred over the past month as the stock started to log new all-time highs. 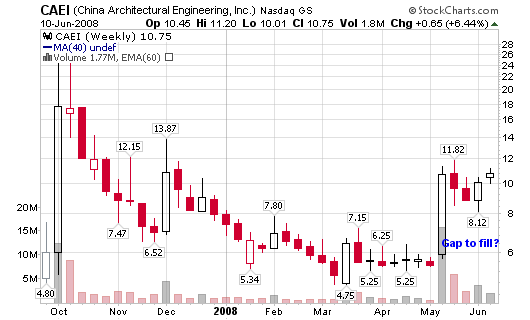 CSUN – 13.06, China Sunergy Co. is now up more than 47.74% over the past month but is still down 20% from my original 2008 post of $16.15 on January 4, 2008 (however, I did state: Ideal Entry: $12.00). The three month gain is 80.93% with a peak of 97% – I timed this one wrong but saw the trending potential back at the turn of the year. Patience – a must in this business. CSUN did reverse Monday – the first red flag in May. China Sunergy (CSUN) is part of a booming solar industry that includes stocks such as the ones listed below; all head lined by FSLR, a stock that is up more than 700% over the past year or so. One last word: watch the daily action because the summer months are coming – sell off time (hint, hint). Have all stops set and always look for red flags! Enjoy the momentum while it lasts but NEVER let a solid gain slip away. Today I cover four stocks that have been padding my portfolio over the past several weeks (months if we narrow it to EDU and JASO). Both EDU and JASO could be in my portfolio for many more months to come based on their fundamental and technical characteristics. This is in addition to the speculation lead-up to the Olympics in China. 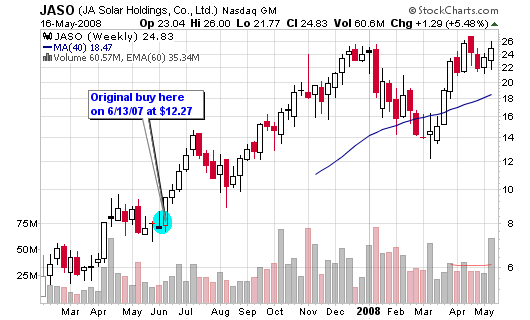 JASO – 24.83, JA Solar Holdings is currently trading in the handle portion of a cup with handle base (one of the prime setups in the CANSLIM philosophy). 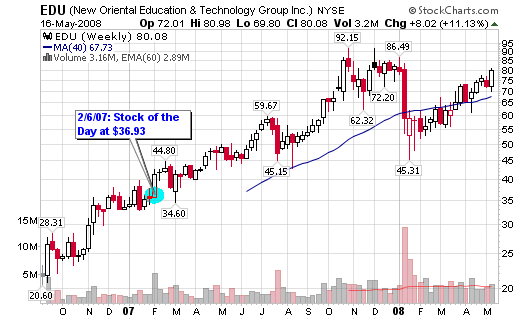 EDU – 80.08, New Oriental Education & Technology Group has come a long way since its correction down to the mid-$40 range. It closed above $80 on Friday and is now back within 15% of a new all-time high. 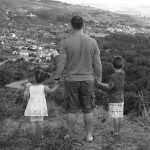 Intercontinental Education – The 20% Rule? EDU Breakout on Huge Volume! GU – 17.00, Gushan Environmental blasted 22.39% higher last week on above average volume as it closed at a new all time high.